DOS Space Quest: Chapter I - The Sarien Encounter (2.2) in 00:52.04 by DrD2k9, c-square & Radiant. Space Quest: Chapter I - The Sarien Encounter is a humorous sci-fi adventure game made with Sierra's AGI engine. 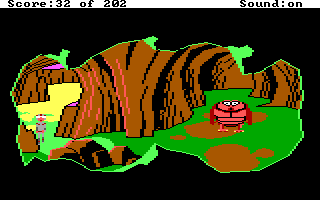 The gameplay is similar to that of King's Quest: the player navigates Roger around with the arrow keys and interacts with the game world by typing commands. There are puzzles to solve and plenty of situations where the player will have to use his wit to save Roger from death. DrD2k9, c-square and Radiant speed through the game in record time. Due to the sheer speed of the movie, the second set of encodes play back the movie at 1/5th of the regular speed.